Pastor-Satorras, R.; Rothman, D. H.
We formulate a stochastic equation to model the erosion of a surface with fixed inclination. Because the inclination imposes a preferred direction for material transport, the problem is intrinsically anisotropic. At zeroth order, the anisotropy manifests itself in a linear equation that predicts that the prefactor of the surface height–height correlations depends on direction. The first higher order nonlinear contribution from the anisotropy is studied by applying the dynamic renormalization group. Assuming an inhomogeneous distribution of soil substrate that is modeled by a source of static noise, we estimate the scaling exponents at first order in an e-expansion. These exponents also depend on direction. We compare these predictions with empirical measurements made from real landscapes and find good agreement. We propose that our anisotropic theory applies principally to small scales and that a previously proposed isotropic theory applies principally to larger scales. Lastly, by considering our model as a transport equation for a driven diffusive system, we construct scaling arguments for the size distribution of erosion “events” or “avalanches.” We derive a relationship between the exponents characterizing the surface anisotropy and the avalanche size distribution, and indicate how this result may be used to interpret previous findings of power-law size distributions in real submarine avalanches. 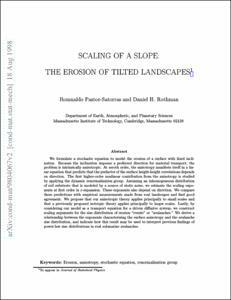 Pastor-Satorras, R., Rothman, D. H. Scaling of a slope: the erosion of tilted landscapes. "Journal of statistical physics", Novembre 1998, vol. 93, núm. 3-4, p. 477-500.